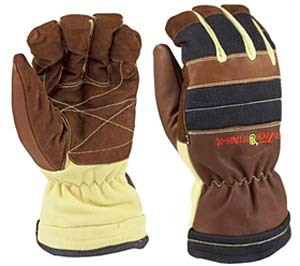 The Pro-Tech Titan K Structural Firefighting Gloves are marketed as extremely versatile, tough and lightweight structural firefighting gloves. 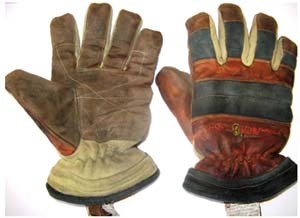 They are primarily constructed of kangaroo leather, but also include portions of a polymer and Kevlar blend that adds increased mobility and breathability to the back of the hand. Over the past few months my pair of Titan K gloves has been put through the ringer. They have been worn during many hours of training evolutions with hoses, hand tools, power tools, ladders – you name it. They have also been used during several live fire training events including three burn buildings, LPG training and a flashover simulator. I’ve even warn them during a couple PT sessions. The gloves have performed magnificently. Out of the box, the Titan Ks were a little stiff and difficult to get on, but were for the most part comfortable and were very well fitting – even brand new. The break in period was relatively brief and after wearing them for a couple hours, and getting them wet, the gloves felt as though I had had them for years. As advertised, the gloves are lightweight and do not hold water like some other structural gloves I’ve had in the past. The Titan Ks offer great dexterity, which increases as the leather is broken in and the gloves become much easier to doff and don over time. The kangaroo leather palms can be slippery when dry, but I have found that a little moisture on the leather makes it very tacky for a great grip on tools, fire hose, door knobs, etc. The gloves offer solid thermal protection as well and the only time my hands felt hot in them was in the flashover simulator. With the gloves resting palms down and the backs exposed to the extreme temperatures in the flashover box, I could feel some pretty good heat on the backs of my hands, but nothing painful and I did not suffer any burns. After several months of wearing the gloves nearly every day in training, they are holding up quite well. They look well worn, but the stitching is intact and there are no tears or deformities on the polymer portions or the kangaroo leather. Overall, I have been very impressed with the Pro-Tech Titan K gloves. I’ve found them to be the most comfortable structure gloves I have owned. I have also been impressed with the durability of the gloves. I was expecting that wearing them day in and day out would exhaust the materials quickly, but there is still a lot of life left in them. Unless the user is running multiple fires every day, I would expect to get at least a few years out of the gloves. I would recommend these to all firefighters willing to spend a little extra for a great product. They are comfortable, functional and durable and in my opinion a worthwhile investment. Get your own pair of Titan K's, today!